If you’ve ever left a hot yoga class wishing for a cold beer, there’s a new product that will make that happen. 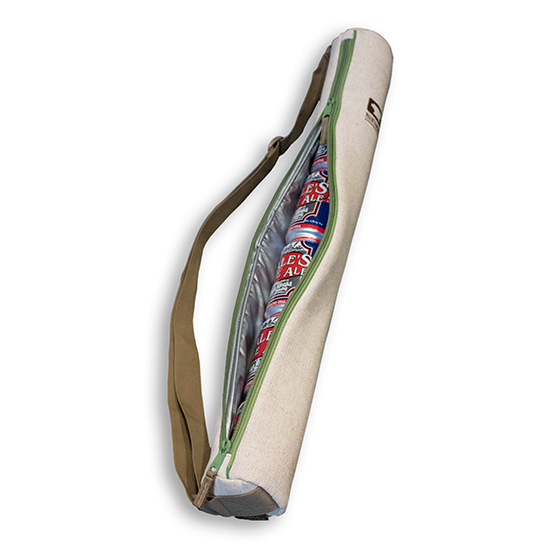 Backpack manufacturer Mountainsmith has invented an over-the-shoulder beer carrier that looks just like a yoga mat bag. Not only is it inconspicuous, it makes it easier than ever to pick up that cute guy or girl who always works out in front of you for a drink. The tube-shaped bag has a full-length zipper, an adjustable shoulder strap and a waterproof lining. More importantly, it stores and chills six standard cans or four tallboys of your favorite suds. At a featherweight 9 ounces, you can carry around a full afternoon’s worth of beverages to the park without breaking a sweat. Of course, nothing is keeping you from using it for your actual yoga mat, but we think loading it up with Dogfish Head Namaste is a much better use.